This trio of Christmas Tree Crochet Patterns is perfect for decorating a mantel or creating a beautiful festive tablescape. And they make a great base for you to add your own creative touches and embellishments. Trees are worked in unjoined rounds. You may want to use a stitch marker to keep track of rounds. Using all three colors, change colors randomly after each round. Round 1: Ch 1, work 4 sc in ring — 4 sts. Round 2: *Work 2 sc in next st, 1 sc in next, rep from * — 6 sts. Round 3: Work 1 sc in each st around — 6 sts. Round 4: *Work 2 sc in next st, 1 sc in each of the next 2 sts, rep from * — 8 sts. Round 5: Work 1 sc in each st around — 8 sts. Round 6: *Work 2 sc in next st, 1 sc in each of the next 3 sts, rep from * — 10 sts. Round 7: Work 1 sc in each st around — 10 sts. Round 8: *Work 2 sc in next st, 1 sc in each of the next 4 sts, rep from * — 12 sts. Round 9: Work 1 sc in each st around — 12 sts. Round 10: *Work 2 sc in next st, 1 sc in each of the next 5 sts, rep from * — 14 sts. Round 11: Work 1 sc in each st around — 14 sts. Round 12: *Work 2 sc in next st, 1 sc in each of the next 6 sts, rep from * — 16 sts. Round 13: Work 1 sc in each st around — 16 sts. Round 14: *Work 2 sc in next st, 1 sc in each of the next 7 sts, rep from * — 18 sts. Round 15: Work 1 sc in each st around — 18 sts. Round 16: *Work 2 sc in next st, 1 sc in each of the next 8 sts, rep from * — 20 sts. Round 17: Work 1 sc in each st around — 20 sts. Round 18: *Work 2 sc in next st, 1 sc in each of the next 9 sts, rep from * — 22 sts. Round 19: Work 1 sc in each st around — 22 sts. Round 20: *Work 2 sc in next st, 1 sc in each of the next 10 sts, rep from * — 24 sts. Round 21: Work 1 sc in each st around — 24 sts. Round 22: *Work 2 sc in next st, 1 sc in each of the next 11 sts, rep from * — 26 sts. Round 23: Work 1 sc in each st around — 26 sts. Insert small cone into crocheted piece to check fit. If needed, add more rounds, working increases on even rounds, until the cone is covered. Round 24: With glitter yarn, work 1 sc in each st around — 26 sts. Using two colors, change color after each round. Work Rounds 1 through 23 of Small Tree pattern. Round 24: *Work 2 sc in next st, 1 sc in each of the next 12 sts, rep from * — 28 sts. Round 25: Work 1 sc in each st around — 28 sts. Round 26: *Work 2 sc in next st, 1 sc in each of the next 13 sts, rep from * — 30 sts. Round 27: Work 1 sc in each st around — 30 sts. Round 28: *Work 2 sc in next st, 1 sc in each of the next 14 sts, rep from * — 32 sts. Round 29: Work 1 sc in each st around — 32 sts. Round 30: *Work 2 sc in next st, 1 sc in each of the next 15 sts, rep from * — 34 sts. Round 31: Work 1 sc in each st around — 34 sts. Round 32: *Work 2 sc in next st, 1 sc in each of the next 16 sts, rep from * — 36 sts. Round 33: Work 1 sc in each st around — 36 sts. Round 34: *Work 2 sc in next st, 1 sc in each of the next 17 sts, rep from * — 38 sts. Round 35: Work 1 sc in each st around — 38 sts. Round 36: *Work 2 sc in next st, 1 sc in each of the next 18 sts, rep from * — 40 sts. Round 37: Work 1 sc in each st around — 40 sts. Round 38: *Work 2 sc in next st, 1 sc in each of the next 19 sts, rep from * — 42 sts. Round 39: Work 1 sc in each st around — 42 sts. Insert medium cone into crocheted piece to check fit. If needed, add more rounds, working increases on even rounds, until the cone is covered. Using one colors and the glittery yarn, change after each round. Work Rounds 1 through 39 of Small and Medium Tree patterns. Round 40: *Work 2 sc in next st, 1 sc in each of the next 20 sts, rep from * — 44 sts. Round 41: Work 1 sc in each st around — 44 sts. Round 42: *Work 2 sc in next st, 1 sc in each of the next 21 sts, rep from * — 46 sts. Round 43: Work 1 sc in each st around — 46 sts. Round 44: *Work 2 sc in next st, 1 sc in each of the next 22 sts, rep from * — 48 sts. Round 45: Work 1 sc in each st around — 48 sts. Round 46: *Work 2 sc in next st, 1 sc in each of the next 23 sts, rep from * — 50 sts. Round 47: Work 1 sc in each st around — 50 sts. Round 48: *Work 2 sc in next st, 1 sc in each of the next 24 sts, rep from * — 52 sts. Round 49: Work 1 sc in each st around — 52 sts. Insert large cone into crocheted piece to check fit. If needed, add more rounds, working increases on even rounds, until the cone is covered. I can’t wait to see what you come up with … be sure to share your finished projects on my Facebook page! Click here for more of my free Christmas crochet patterns. Thanks for sharing, I know it’s an old post, but it’s still great. What is an unjoined round? Hi Margarita 🙂 An unjoined round is a round where you don’t end by slip stitching into the first stitch to join to round but instead work in a spiral. I have the photo and the round numbers, but no pattern detais whatsoever!!! Hmmm … I’m not sure why; the pattern is showing on my end. These trees are so cute….thanks for the free pattern! These are really sweet, thanks for the pattern. Do you think they’d be stiff enough if I stuffed them well and didn’t use a cone? These are just too absolutely cute! A lovely pattern once more, love the beautiful decoration of your trees! 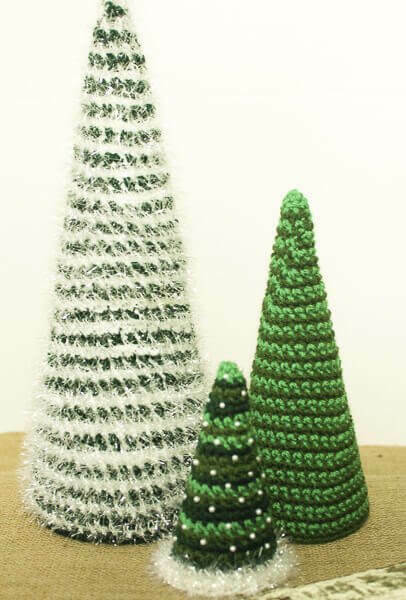 My mother used to make crocheted Christmas trees, but quite different from these – I like this version a lot! Hi I love your trees and I pinned it. TFS at moogly. 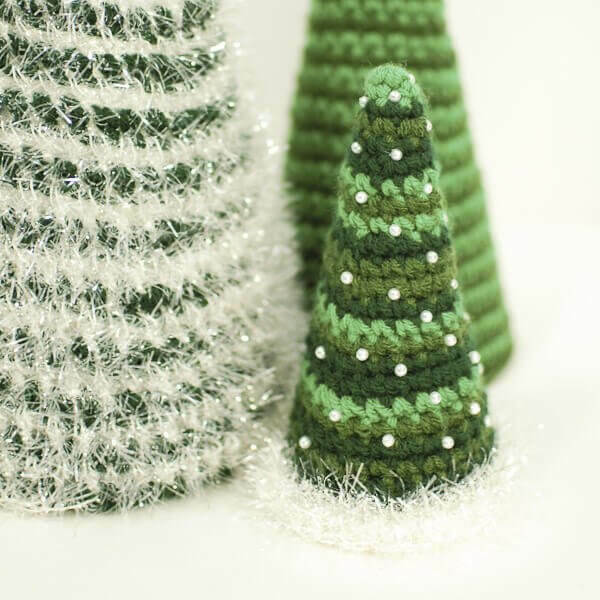 These crochet cone trees are looking fabulous! I love the eyelash yarn details. Awesome! Love the combination of the three. You are such a good pattern writer, Kara.